With distance and time a factor we have had to leave our farm share behind. There are a few weeks left of our farm share but we are left a little too remote to pick it up. This week would have brought us fennel (or broccoli), leeks, potatoes, carrots, celeriac, onions, lettuce, kale and chard. Unfortunately, I know this thanks to Farmer Ted's weekly email and not because it is currently sitting in my fridge. There is a farmer's market in town that we will likely visit this weekend in hopes of making up for vegetables lost. Incidentally, if you live in the vicinity of the George Washington Bridge and want some free vegetables for the next few weeks, contact me for details. One of the last hurrahs for the farm share was this absurdity. 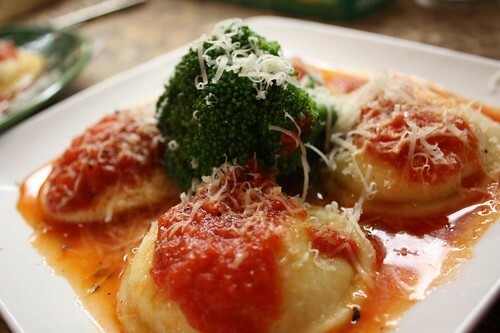 It was just the remaining broccoli with some cheese ravioli and simple tomato sauce. A lack of creativity blended perfectly with a freezer full of quick fix meals that I'd stocked up on last week prior to a few late nights at work and Jen contracting the flu. While Jen had the flu I didn't make much aside form chicken soup, a large pot of turkey stock and about two gallons of apple sauce from the last three weeks of farm apples we've received. I would have posted pictures but strangely the turkey stock and apple sauce look pretty similar. So similar, in fact, that Jen almost ate a spoonful of turkey stock the other night before I intercepted her. I fear that had I not interrupted her action she may have been put off both stock and apple sauce for a very long time. Tuesday night was the first real dinner in a while. I roasted a red snapper stuffed with lemon wedges, parsley, and capers along with my traditional oven fries. I also made a mixed greens salad with grape tomatoes and goat cheese. Tonight was another low-inspiration, high convenience meal. 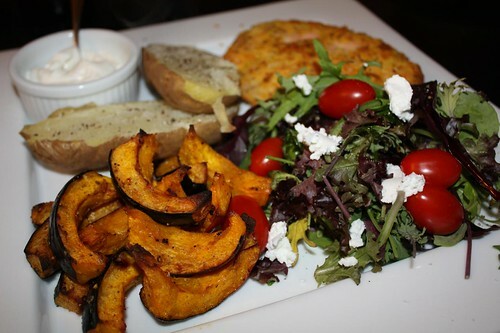 I baked this mustard-panko chicken breast along with wedges of acorn squash from the farm which I tossed with olive oil, sea salt, cayenne, and cumin. As an accompaniment I made a rerun of Tuesday's salad with a baked potato. This weekend may bring a trip to the farmer's market to make up for the vegetables we have been missing. There may have also been enough time that has passed so that we might be able to go out to dinner again after our initial move in to the new place. Oh, just imagine the wild adventures we will have this weekend with no one dying from the flu, no out of state weddings, and gas. It's going to be a wild time. Oh that ravioli dish looks delicious! My boyfriend and I recently moved in together and also decided to start getting a farm-share at the same time. I think the pressure of "using everything from the box" adds to our eating and cooking together - we have to talk about what we are going to eat, how we are going to use certain ingredients, etc. a lot more than we ever did before! Glad that Jen is feeling better. 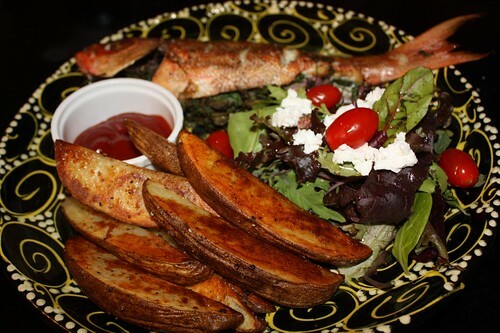 These meals look pretty darn good!